Coastal strand, dunes, marsh between ocean edge and water treatment plant. Location: From Ventura, take Harbor Blvd. (becomes Channel Islands Blvd. as it curves to left.) Stay on Channel Islands to Ventura Rd. and turn right. Follow to end. Pay fee and park. Or, turn left on Hueneme Rd., continue to Perkins Rd. (just past “J” St.), turn right, go to end. Free parking at end of road on right. Highlights: Endangered least tern/snowy plover nesting site. Sea and shorebirds, terns, brown pelican, bitterns. Rare migrants often found. 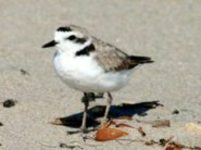 Best season: All year, especially summer for shorebirds; late spring and summer for nesting species. Services: Restrooms, Parking, Fee at Pt. Hueneme Beach, free at end of Perkins Rd.